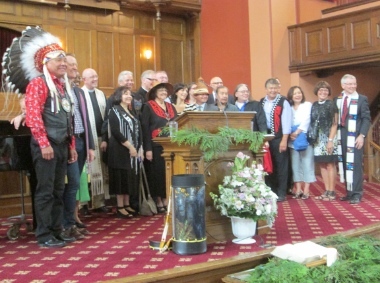 Several Indigenous leaders, including former national chief of the Assembly of First Nations Shawn Atleo, joined eight downtown pastors for an afternoon ecumenical prayer service at First Baptist Church May 31. 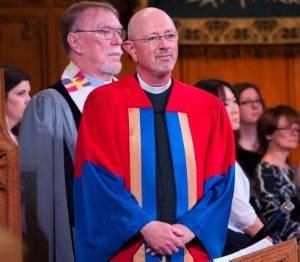 Peter Elliott began Sunday, May 31 by preaching to his 8 am Christ Church Cathedral congregation (he is rector of the cathedral and dean of the Anglican Diocese of New Westminster). Peter Elliott with Rev. Jim Smith in the ecumenical service at St. Andrew’s-Wesley United Church. Photo by Randy Murray. It’s been a journey for many Canadians, one that I’ve felt very caught up in. It was 1990 in Winnipeg that I attended my first meeting of the Anglican National Executive Council, and at that meeting, under the glare of TV lights, two survivors of the schools told the Council the story of their experience including the cultural and physical abuse that they endured. It came as a shock, back then, to learn that these schools, which the Government of Canada funded and the churches ran, were something other than beneficial. . . .
I’ve had the privilege to be pretty close to a number of events throughout this period: and what it taught me is that this is not just an “Indian problem” that needs to be solved: this is a Canadian issue that calls for the transformation of the way we do things in this land. The work of the TRC isn’t just about residential schools, it’s about a mindset that supported a policy of assimilation for first nations. Mary Fontaine, director of Hummingbird Ministries, led a Four Directions prayer during the St. Andrew’s-Wesley service. Photo by Randy Murray. Before Sunday was over, Elliott had also played an active role in a 10:30 am ecumenical service at St. Andrew’s-Wesley United Church, crossed Burrard Street for a street fair at the Wall Centre and then kitty-corner to First Baptist Church for an ecumenical prayer service – all as part Reconciliation Matters, in honour of the TRC process. Elliott is one of many ecumenical leaders I have met over the past few years who are committed to righting the wrongs of the residential school system and the colonial/racist attitudes in which it was embedded.Most are from the four denominations which ran almost all the schools – Anglican, Roman Catholic, United and Presbyterian – but many evangelical leaders are taking the issues very seriously as well. Many west coast Christians went to participate in the TRC closing events in Ottawa. This final national event of the TRC is not an ending, it is a beginning. 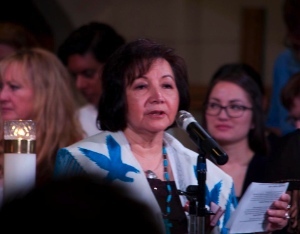 It is an invitation to honesty and truth-telling and to consider changing our ways as a nation to learn from the sacred circles of first nations and to have our hearts moved and touched so that we could live better, with greater respect, upholding as our baptismal covenant suggests, the dignity of every human being. Whatever faces you this week, I hope you take some time to watch or read about this important work in Ottawa, and that you might encounter the creative energy of the God who is love and invites us all into the work of transformation. Which brings us to the report and recommendations of the TRC. For church parties, in collaboration with survivors and representatives of Aboriginal organizations, to establish permanent funding for Aboriginal people for: 1) community-controlled healing and reconciliation projects; 2) community-controlled culture-and-language revitalization projects; 3) community-controlled education and relationship-building projects; 4) regional dialogues for Indigenous spiritual leaders and youth to discuss Indigenous spirituality, self-determination and reconciliation. I hope that many church members – not just pastors – will read the TRC’s full report. 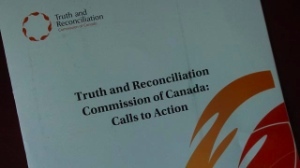 The Anglican Church of Canada, the Presbyterian Church in Canada, the United Church of Canada, the Roman Catholic Entities Parties to the Settlement Agreement and the Jesuits of English Canada made a statement in response to the findings and Calls to Action issued by the TRC. Over the past six years we have, along with the Commission, listened to the experiences of those former students, who are no longer children. They are adults, some very old, who tell heart-breaking stories. We have heard them speak of wounds so deep that healing could not happen, and of damage visited upon their own children. We have also heard them witness to their resilience, and that of their communities, which has made possible many healing journeys. We have heard of friendships formed in the Residential Schools in which students supported one another, sometimes for the rest of their lives. Perhaps most humbling of all, we have heard survivors speak with enormous grace and generosity of teachers and others whose kindness offered some respite from the pain and humiliation that so deeply marked the overall experience of the schools.